We now produce 20 times more plastic than we did in 1964, a vast rubbish-scape of bottles and wrapping and hard plastic lids that is expected to double in size in the next 20 years – and almost quadruple in size by 2050. These were the findings of a 2016 report by the World Economic Forum and Ellen MacArthur Foundation , launched at Davos last year. The report, The New Plastics Economy: Rethinking the Future of Plastics , analysed the flow of materials around the world and predicted that, given the projected growth in production, by 2050 oceans could contain more plastics than fish. Economically speaking, this meant a loss of as much as $120 billion in plastic packaging material value every year. So how well has it worked? After a year in action, a new report, launched today, takes stock of commitments by government and industry, as well as leading players in the plastic-packaging supply chains. 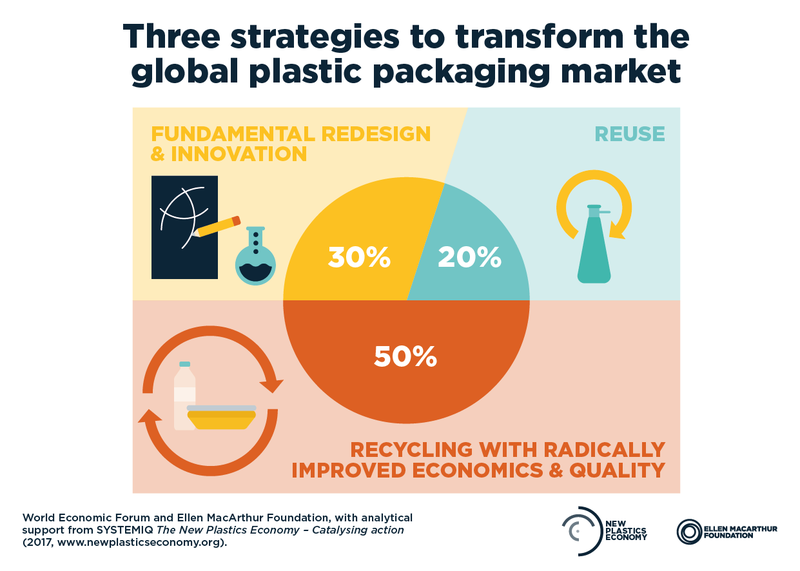 Among the achievements listed in A New Plastics Economy: Catalysing Action , are new bans on single-use carriers bags, cleaner production strategies among industry leaders and a groundswell of consensus that has given rise to movements such as #breakfreefromplastic .